After the Friday practice sessions, it looks as if the race will be the usual battle between Ferrari and McLaren. Hamilton was quickest in the first session and was second after an all-out effort by Alonso grabbed the best time in the second. Ferrari are looking good, however, with Massa trading fast sector times with Hamilton and Kovalainen and Raikkonen very quick too. Both sessions were dry and, at a guess, I would say that the Ferrari is marginally the better car to have in those conditions. Hamilton seems able to make up the difference but Heikki was a little slower, perhaps giving a more accurate picture of the McLaren's performance. The winner of the race ought to come from one of the two championship leaders but F1 rarely stays true to the form book these days. Best of the rest is either BMW or Renault, Kubica and Alonso being the quicker in their respective cars. 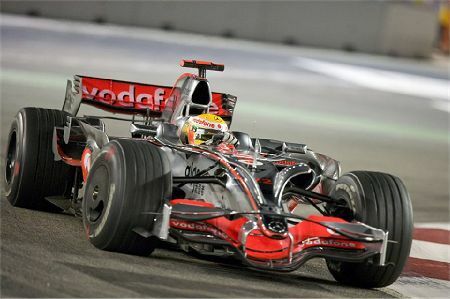 Kubica was consistently fast, often separating McLarens and Ferraris but it was left to Alonso to produce a banzai lap at the last to grab the glory. In qualifying it is doubtful that he will manage to be quite as high up the grid but he looks good for the top ten, at least. The fight to get through to Q3 is getting tougher as the season wears on and it was a surprise to see Button battling with the contenders in practice. Whatever Honda have done to his car does not seem to have applied to Barrichello's, the Brazilian having trouble lifting himself off the bottom of the time sheets. Rosberg came to life here, 6th fastest in the first session and 5th in the second. The Williams seems to like the circuit, Nakajima also putting in a strong performance and finishing practice in ninth. In contrast, the STR has dropped away and Vettel fell out of the top ten to join Bourdais in the mid-teens. Red Bull's Mark Webber was the star of the sister teams this time, having to wait out most of both sessions while accident damage was repaired, but then emerging near the end to set 11th fastest time in very few laps indeed. The Toyota pair seemed to spend most of their time investigating Singapore's run-off areas, Trulli picking up a hefty fine for entering the pit lane from the wrong end after one of his spins. Once again, the Japanese team seem to have confused themselves after a fairly good run of form. So Hamilton looks a good bet for pole with Massa being his closest challenger. Raikkonen is likely to be next up and Heikki in fourth. After that, it is a fight between Kubica, Alonso and Rosberg, probably with the top ten being filled out with Webber, Glock and Vettel. For some reason, I just cannot see Button getting the Honda up that far. The race itself will be tight, with no obvious overtaking points and a fairly dangerous outfield waiting to catch the unwary. As feared, the combination of lighting and concrete walls makes the track seem enclosed by black night, only the helicopter shots giving us an impression of the city that surrounds it. The circuit has rather more atmosphere than Valencia managed, however, and is interesting enough to hold our attention, I think. Unless it rains, it will not be a great race but it might not be the worst this season. I agree totally that the closer shots do make the track look very enclosed by the black night. But the wider TV pictures (the helicopter shots especially) are pretty impressive. The absolute lack of any overspill of the light make the track look amazing from a bit of a distance as it snakes through the city. One of the things that was highlighted during live comments today was that the pit exit feed straight into a chicane. You have to wonder what kind of idiot signed off on that. The circuit does looke spectactular but I have severe reservations about the marshals which I had predicted would be a problem. They had two very minor simple accidents to clear and it took them more than 5 minutes on each occasion. Why does this track not have decent cranes and why have the marshals not been properly trained? I agree that the wider shots are very impressive - and the sight of that circuit of light winding through the dark city is fantastic. Just one word of optimism: every year we are told that Monaco offers no overtaking opportunities, prepare yourselves for a processional race, etc. but usually races at Monaco turn out to be much better than expected. I don't know why that happens but it's possible the same principle will be at work in Singapore.